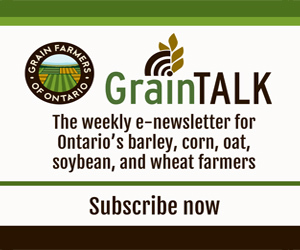 If corn or soybean producers are considering switching to biofuel crops such as miscanthus and switchgrass, it could be at the expense of soil quality, says a University of Guelph microbiologist. Prof. Kari Dunfield says in grain production, carbon-rich residue is left behind; but in biofuel production, the grass residue is harvested along with the stalks. This practice could potentially lead to less carbon being absorbed into the soil. But there’s a flip side to this. Dunfield says it’s important to remember farmers also have to consider that biofuel crops are much larger, as much as eight feet in height. They have huge root systems, which might actually contain enough carbon to cancel out adverse effects. These are the kinds of scenarios and questions Dunfield is addressing in her pursuit to provide producers with clear information about how they can best maintain environmentally stable production systems. Others involved in this research are graduate student Karen Thompson and Plant Agriculture Prof. Bill Deen. Ontario corn fields could one day be the source of not only food, feed and fuel but also eco-friendly paints, age-defying super-moisturizers and non-toxic drug treatments — all thanks to tiny particles generated from Ontario corn. Physics researchers Prof. John Dutcher and Anton Korenevski say these particles could serve as non-toxic, biodegradable replacements for petroleum-based ingredients. This could make any product more environmentally friendly, be it paint, cosmetics or even biomedical treatments. The researchers are now working with corn specialist Greg Stewart of the Ontario Ministry of Agriculture, Food and Rural Affairs (OMAFRA) to determine which corn varieties and harvesting practices yield the most particles. “With Ontario corn, we now have a natural renewable source that will help pave the way to greener products,” says Dutcher. Consumers are lining up for more whole grain products, but companies must make sure taste isn’t sacrificed in this drive for healthier eating. Case in point: macaroni and cheese. In collaboration with Kraft Mills of Mississauga, food science Profs. Lisa Duizer and Koushik Seetharaman and master’s student Ryan West are trying to determine just how much whole grain can be incorporated into the low-cost staple. They’re making progress. A trained panel tested the taste, flavour and texture of macaroni made from zero, 25, 75 and 100 percent hard white flour. Cooking quality was also assessed. It turns out that as the amount of bran increased, the pasta became rougher, less firm and more bitter. Next, the researchers will try to find out how much consumers enjoy the pasta, as whole grain content increases.